A few weeks ago I decided to go for a walk in the woods near my house. It was late afternoon, and the sun had already started to set giving the sky a purplish golden palette. There was a light dusting of snow on the ground, just enough to cover the leaves that had fallen last November. I stopped walking and stood still for a moment to listen. It was dead silent. Not a sound–not even a bird chirping. The coolness of the winter air chilled my already red cheeks. The only living being besides myself were the towering oak trees that ruled these woods. In the world of Star Wars, trees have always been an integral part of the story. From Legends we had the ancient Jedi Master Ood Bnar, a member of the Neti species, whose shape-shifting abilities allowed him to change into his true tree-like form when Sith Lord Exar Kun attempted to steal ancient Jedi artifacts including scrolls and lightsabers. In his transformation, Ood Bnar was successful in protecting the priceless artifacts and living for thousands of years afterward, surviving the Great Jedi Purge 19 years before The Battle of Yavin, only to have sacrificed himself once again ten years after The Battle of Yavin when confronted once again by Dark Jedi. For any living species, sentient or not, there comes a matter of respect for something that can live for thousands of years. Some could argue that trees have wisdom that humans, or other sentient life, alien or terrestrial, will never possess. 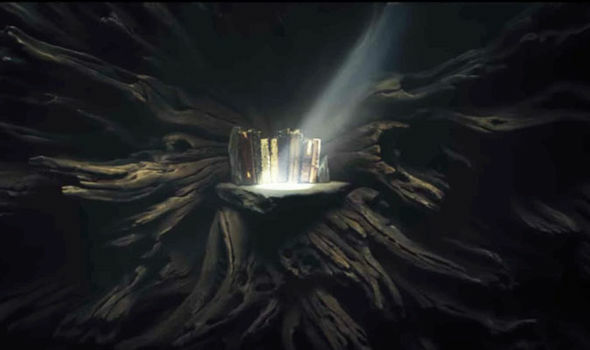 While in the Star Wars galaxy we have Force sensitive trees on the grounds of the Jedi Temple on Coruscant, gnarltrees in the swamps of Dagobah, and in Star Wars Episode VIII: The Last Jedi, the sacred Jedi Texts are kept inside an Uneti tree on Ahch-to. Entire worlds like Kashyyyk and the forest moon of Endor were covered with trees. The Jedi could look to a tree to understand how a Jedi should live their life-with peace, strength, and nobility. Force sensitive tree near the Jedi Temple on Coruscant. Even here on Earth, there have been examples of trees dating back 5,000 years or more. In Inyo National Forest, California, Bristlecone Pines have been found dating back 4,789 years according to the rings in the bark. It’s gnarled appearance an apparent visual influence on the trees located outside the Jedi Temple in The Clone Wars episode “Wrong Jedi.” A branch of the very same tree was seen in the Marvel Star Wars comic book series, Shattered Empire. In Japan, The Child-Giving Gingko stands in the courtyard of the Zoshigaya Kishimojin Temple in Tokyo. Tradition holds that this tree brings fertility to its worshippers. In Lincolnshire, England, the tree under which Isaac Newton sat when the apple fell (not on his head contrary to legend), still stands despite a storm nearly destroying it in the 19th century. In Derby, Australia, a Boab tree, with its bulbous trunk, has provided water, food, shelter, medicine, for Aboriginals. In Santa Maria Del Tule, Oaxaca, Mexico, a Montezuma Cypress stands at 119 feet in circumference and approximately 38 feet in diameter. In Varanasi, India, a Neem tree is known as the cure for ailments and a manifestation of the Hindu goddess Shitala. In Fishlake National Forest, Utah, 47,000 thousand tree trunks, covering 106 acres sprang from one seedling of Quaking Aspen, dating back tens of thousands of years old. Despite each tree not being older than 150 years, the root system may be the oldest living organism on Earth. A Mango tree in Naunde, Mozambique serves as a place for storytelling, ceremonies, and regulating village life. Lastly, in New York City a Pear tree known as the “survivor” remains as a sign of resiliency in the aftermath of the terrorist attack on 9/11. As someone whose last name means “Oaktree” in Dutch, I have always been fascinated by trees and their majestic prowess. As old and wise as Master Yoda was, In their silence, we could learn just as much from these giant pillars of time-how to be patient for one. Their long lives allow for them to take things in stride-a lesson of the Jedi-not to act out in anger, but with calmness and tranquility. In Star Wars, wisdom goes a long way. Some journeys require strength, courage, resiliency, and knowledge, qualities that are all found in the some of the oldest living beings on any planet-trees. Next time you’re going for a walk in the woods, take a moment to look up. Appreciate the remarkable life a tree has lived before you arrived and after. Newman, Cathy. “The Wisdom of Trees.” National Geographic, March 2017, pp. 52-73. I remember when Disney’s “Pocahontas” came out, and one of my sisters-in-law was rather bothered by the fact that the animated film featured a talking tree, Grandmother Willow (granted, she never seemed bothered by talking animals and birds in other animated films, but that’s neither here nor there 😉 ). “Trees don’t talk, Melinda!” she proclaimed. “Children will think that they do when they watch this movie!” I assured her that wouldn’t be the case (whether she believed me or not I really couldn’t say) because, in reality, trees do not “talk”. But as you so astutely point out, they do tell us things, and there are a good many scientists out there who would agree. Besides, trees are great symbols — again, just like you point out. 🙂 Quite frankly, I can’t imagine a world without them. I wouldn’t want to. p.s. what did you think about Yoda making sure the Uneti tree was destroyed? Fitting? A travesty? Just curious. I think Yoda destroyed that tree to make a point. He wanted to prove to Luke that the Force doesn’t draw it strength from it nor do the lessons require a book. All that matters is your connection to the Force and what lies within yourself.